December 23rd, 2018 - Holy Trinity Cathedral Auckland, New Zealand - Inclusion of Adam lay ybounden in the cathedral’s Festival of Nine Lessons and Carols. December 16th, 2018 - Christ Church Cathedral, Nashville, TN - Inclusion of Adam lay ybounden in the cathedral’s Festival of Lessons and Carols service. Conducted by Canon Dr. Michael Velting, Joseph O’Berry, Organ. November 16th, 2018 - Hurley School of Music, LA - Performances of I Shall Not Live in Vain and The Dream I Knew by Centenary College Camerata, conducted by Cory Wikan. November 11th, 2018 - Cathedral Basilica of Saints Peter and Paul - The second performance of The Last Letter, performed by Westminster Williamson Voices, James Jordan, conductor. Concert also includes the second performance of The Dreams that Remain and a performance of the third movement from O Great Beyond. November 10th, 2018 - Ridgefield, CT - The world premiere of The Gift to Sing, commissioned by the Ridgefield Chorale, Daniela Sikora, conductor. November 9th, 2018 - Westminster Choir College, Princeton, NJ - The world premiere of The Last Letter, commissioned by Westminster Williamson Voices, James Jordan, conductor. Concert also includes the second performance of The Dreams that Remain and a performance of the third movement from O Great Beyond. November 6th, 2018 - Bryn Mawr, PA - The world premiere of If I Must Go, commissioned by the choirs of Church of the Redeemer, Michael Diorio, conductor. October 27th, 2018 - First Congregational UCC, Washington, DC - Performance of Songs of the Questioner with Thomas Circle Singers, James Kreger, conductor. October 25th-28th, 2018 - Kalamazoo, MI - In attendance at the 2018 Michigan ACDA conference. October 26th, 2018 - Kalamazoo, MI - The world premiere (part 2) of Our Waking Souls, commissioned by the Northern Michigan University Arts Chorale, Erin Colwitz, conductor at the 2018 Michigan ACDA conference. October 21st, 2018 - Trinity Episcopal Church, Watertown, NY - Performances of Songs of the Questioner, Lux aeterna, Salvator mundi, The Dream I Knew and The Same Stream with James Jordan and The Same Stream. October 13th, 2018 - St. Peter’s Cathedral, Marquette, MI - The world premiere (part 1) of Our Waking Souls, commissioned by the Northern Michigan University Arts Chorale, Erin Colwitz, conductor. October 13th, 2018 - St. Matthew-in-the-City, Auckland, New Zealand - The New Zealand premiere of Songs of the Questioner with Auckland Youth Choir, Lachlan Craig, conductor. September 21st, 2018 - Worldwide release of Songs of the Questioner, the first full-length album from GRAMMY-nominated conductor James Jordan and The Same Stream. August 2nd-11th, 2018 - Princeton, NJ and Philadelphia, PA - Annual recording project with James Jordan and The Same Stream. August 6th, 2018 - Cathedral Basilica of Saints Peter and Paul, Philadelphia, PA - The United States premiere of O Great Beyond, performed by The Same Stream, James Jordan, conductor. June 2nd 2018 - St. John's Episcopal Church, Vernon, CT - Performance of As I Walk the Silent Earth with The Vernon Chorale. May 25th, 2018 - Good Shepherd Episcopal Church, Austin, TX - World premiere of The Loam, commissioned by Austin Cantorum, Cristian Cantu, conductor. May 19th, 2018 - Elkhart, IN - World premiere of Return Again, commissioned by Jimtown High School Chamber Ensemble, Rachel Sutch, conductor. May 19th, 2018 - St. Mary's Cathedral, Edinburgh UK - World premiere of Hail, gladdening light, commissioned by The Reid Consort, Cole Bendall, conductor. May 13th, 2018 - St. Edward's Catholic Church, Shelton, WA - Performance of As I Walk the Silent Earth with The Great Bend Chorale, Matthew Blegen, conductor. May 11th, 2018 - West Allis, WI - World premiere (part 2) of In the Dark of the End, commissioned by the choir of Nathan Hale High School, Zachary Beeksma, conductor. May 11th, 2018 - Grace Episcopal Church, Bainbridge Island, WA - Performance of As I Walk the Silent Earth with The Great Bend Chorale, Matthew Blegen, conductor. April 28th, 2018 - St. Michael Lutheran Church, Fort Myers, FL - World premiere of When You Are Old, commissioned by the Fort Myers Symphonic Mastersingers Chamber Choir and the City of Palms Youth Choir, Matthew Koller, conductor. 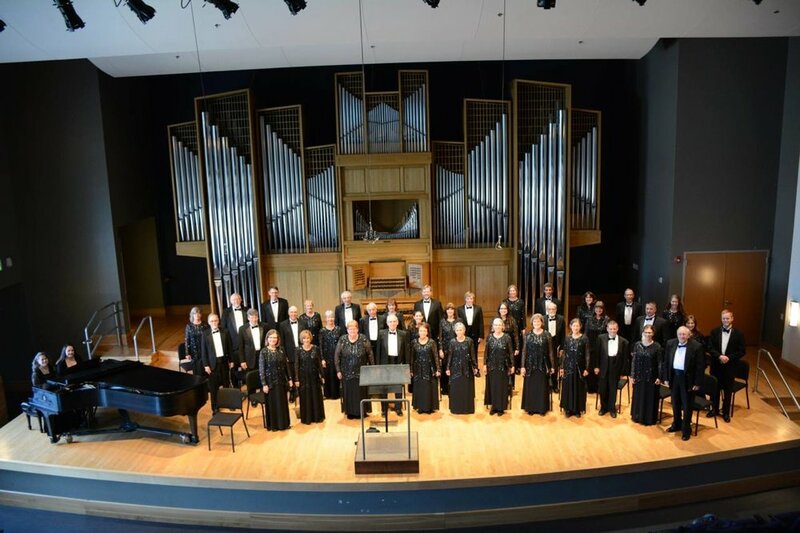 April 22nd, 2018 - Griffin Concert Hall, University Center for the Arts, Colorado State University - The world premiere of The Dreams That Remain, commissioned by Laudamus Chamber Chorale (Laura Gillett, conductor) for their 20th anniversary season. April 19th - 23rd, 2018 - Fort Collins, CO - In residence with Laudamus Chamber Chorale, Laura Gillett, conductor. April 19th, 2018 - Milton, GA - World premiere (part 1) of In the Dark of the End, commissioned by the choir of Cambridge High School, Matthew Van Dyke, conductor. April 15th, 2018 - St. Joseph University Church, Buffalo, NY - Performance of The Dream I Knew with Vocalis Chamber Choir, James Burritt, conductor. April 15, 2018 - Church of the Redeemer, Bryn Mawr, PA - Performance of Steven Heitzer's brass quintet arrangement of my Adam lay ybounden with The Philadelphia Brass. April 8th, 2018 - Trinity Lutheran Church, Des Plaines, IL - World premiere of Starlight, commissioned by Northwest Choral Society, Carling FitzSimmons, conductor. April 1st, 2018, 10:45 am - Good Shepherd Catholic Church, Tallahassee, FL - Third performance of Vigil at Easter Mass. April 1st, 2018, 8:45 am - Good Shepherd Catholic Church, Tallahassee, FL - Second performance of Vigil at Easter Mass. March 31st, 2018 - Good Shepherd Catholic Church, Tallahassee, FL - World premiere of Vigil, commissioned by the choir of Good Shepherd Catholic Church, Anna Marie Friars, conductor. March 18th, 2018 - The Chapel of St. Kentigern, Auckland, New Zealand - World premiere of Neither the Moon by Night, commissioned by the choir of St. Kentigern College, Lachlan Craig, conductor. March 6th, 2018 - Moody Performance Hall, Dalls, TX - Performance of Songs of the Questioner with Arts District Chorale, Constantina Tsolainou, conductor. March 3rd - 7th, 2018 - Dallas, TX - In residence with Arts District Chorale, Constantina Tsolainou, conductor. February 2nd, 2018 - Performance of The Immortal Memory with the Mastersingers Chamber Chorus of Fort Myers, Matt Koller, conductor. January 14th, 2018 - Performance of The Immortal Memory with the Mastersingers Chamber Chorus of Fort Myers, Matt Koller, conductor. January 14th, 2018 - Community Concerts at Second - Baltimore, MD - Performance of Adam lay ybounden (arranged for brass quintet by Steven Heitzer) with The Philadelphia Brass. January 13th, 2018 - Concert Forum at Spring House Estates - Lower Gwynedd, PA - Performance of Adam lay ybounden (arranged for brass quintet by Steven Heitzer) with The Philadelphia Brass. December 24th-25th, 2017 - Metropolitan Cathedral of the Sacred Heart, Wellington, New Zealand - Performances of Ave, maris stella at the Cathedral's carols service and midnight mass, conducted by Michael Fletcher. December 15th, 2017 - Good Shepherd Episcopal Church, Austin TX - The American premiere of Ave, maris stella, performed by Austin Cantorum, Cristian Cantu, conductor. December 6th, 2017 - Metropolitan Cathedral of the Sacred Heart, Wellington, New Zealand - The New Zealand premiere of Adam lay ybounden conducted by Michael Fletcher. November 23rd, 2017 - Elphinstone Hall, University of Aberdeen, Aberdeen UK - Graduation ceremony where I will be presented with the degree of Doctor of Philosophy in Music Composition (PhD). November 19th, 2017 - The Cathedral Basilica of Saints Peter and Paul, Philadelphia PA - Conducted by James Jordan, Westminster Williamson Voices gives the second performance of my newly commissioned work I Shall Not Live in Vain. Also on the program is The Dream I Knew. November 18th, 2017 - Imago Dei Community, Portland OR - Performance of White Stones with Consonare Chorale, Georgina Philippson, conductor. November 17th, 2017 - Bristol Chapel, Westminster Choir College - Conducted by James Jordan, Westminster Williamson Voices sings the world premiere of my newly commissioned work I Shall Not Live in Vain. Also on the program is The Dream I Knew. November 7th, 2017 - Hodgson Concert Hall, University of Georgia - Performance of The Same Stream with the UGA Hodgson Singers, conducted by Daniel Bara. November 5th, 2017 - Episcopal Church of the Redeemer, Bryn Mawr PA - Inclusion of my Lux aeterna in the church's All Souls remembrance service. October 22nd, 2017 - Royal Lane Baptist Church, Dallas TX - Performance of Songs of the Questioner and As I Walk the Silent Earth with the Verdigris Ensemble, Sam Brukhman, conductor. October 21st, 2017 - First Baptist Farmers Branch, Farmers Branch TX - Performance of Songs of the Questioner and As I Walk the Silent Earth with the Verdigris Ensemble, Sam Brukhman, conductor. October 20th, 2017 - St. Andrew United Methodist Church, Plano TX - Performance of Songs of the Questioner and As I Walk the Silent Earth with the Verdigris Ensemble, Sam Brukhman, conductor. October 13th, 2017 - Rockefeller Memorial Chapel - "Light and Gold" a concert co-conducted by Eric Whitacre and Donald Nally, in which my works The Same Stream and The Dream I Knew were performed. August 7, 2017 - Cathedral Basilica of Saints Peter and Paul, Philadelphia PA - Performance of The Same Stream with The Same Stream choir, conducted by James Jordan. August 5-10, 2017 - Cathedral Basilica of Saints Peter and Paul, Philadelphia PA - Recording a CD of the music of Paul Mealor with The Same Stream Choir, conducted by James Jordan. July 4-13, 2017 - St. Stephen's House, Oxford UK - Inclusion of The Dream I Knew, Amid Such Snows, and Salvator mundi in the conductor's repertoire for the 5th annual Choral Institute at Oxford. More information here. Friday, June 30th, 2017 - The Chapel of Queen's College, Cambridge UK - Performance of The Immortal Memory with the University of Aberdeen Chamber Choir, conducted by Paul Mealor. Wednesday, June 28th, 2017 - Ely Cathedral UK - 1:10 pm - Performace of The Immortal Memory with the University of Aberdeen Chamber Choir, conducted by Paul Mealor. June 20th, 2017 - Elphinstone Hall, University of Aberdeen - The world premiere of Fanfare: Pereat Tristitia performed by William Gray. Thursday, June 1st, 2017 - All Saints' Anglican Cathedral, Edmonton AB, Canada - 7:30 pm - Performance of White Stones with Pro Coro Canada, conducted by Michael Zaugg. Sunday, April 30th, 2017 - Plymouth Congregational Church, Fort Collins CO USA - 3:00 pm - Performance of Alleluia with the Laudamus Chamber Chorale, conducted by Laura Gillett. Sunday, April 23rd, 2017 - Princeton Abbey, Princeton NJ USA - 7:30 pm - Performance of The Dream I Knew with Westminster Williamson Voices, conducted by James Jordan. Information can be found here. Saturday, April 22nd, 2017 - First Presbyterian Church, Fort Collins CO USA - 7:00 pm - Performance of Alleluia with the Laudamus Chamber Chorale, conducted by Laura Gillett. Saturday, March 25th, 2017 - St. Louis the King of France Catholic Church, Austin TX USA - 7:30 pm - Performance of As I Walk the Silent Earth with Austin Cantorum, conducted by Christian Cantu. Friday, March 24th, 2017 - St. Andrew's Cathedral, Aberdeen UK - 7:30 pm - World premiere of Endless featuring The Edinburgh Quartet and the University of Aberdeen Chamber Choir and Percussion Ensemble, conducted by Michael Zaugg. Thursday, March 23rd, 2017 - St. Bride's Church, Fleet Street, London UK - 7:45 pm - London premiere of O Great Beyond with the Chapel Choir of Selwyn College, Cambridge, conducted by Michael Bawtree. More information can be found here. Saturday, March 18th, 2017 - Orchestra Hall, Chicago USA - Chicago premiere of 'Orbits' from Songs of the Questioner with the Northwest Choral Society, conducted by Alan Wellman. Thursday, March 9th, 2017 - Minneapolis, MN USA - The Dream I Knew is featured in the GIA/Walton reading session at the ACDA National Conference, conducted by Dr. Amanda Quist. Sunday, March 5th, 2017 - Fort Myers, FL USA - Performance of Songs of the Questioner with the Fort Myers Symphonic Mastersingers Chamber Chorus and Salvator mundi with the City of Palms Youth Choir, conducted by Matt Koller. Wednesday, March 1st, 2017 - King's College Chapel, Aberdeen UK - 5:15 pm - UK premiere of Salvator mundi with the Chapel Choir of King's College, Aberdeen during their Ash Wednesday service. Sunday, February 12th, 2017 - Fort Myers, FL USA - Performance of Salvator mundi with the City of Palms Youth Choir, conducted by Matt Koller. Saturday, February 4th, 2017 - Fort Myers, FL USA - Performance of Songs of the Questioner with the Fort Myers Symphonic Mastersingers Chamber Chorus and Salvator mundi with the City of Palms Youth Choir, conducted by Matt Koller. Tuesday, January 10th, 2017 - Fort Myers, FL USA - Performance of Songs of the Questioner with the Fort Myers Symphonic Mastersingers Chamber Chorus and Salvator mundi with the City of Palms Youth Choir, conducted by Matt Koller. Performing a work of mine? Be sure to report the performance so I can include your concert on this event calendar and register it with ASCAP.